Looking for a chocolate gift for the vegetarian in your life? 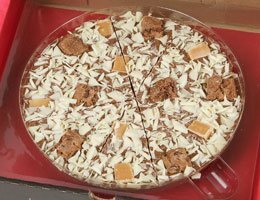 Well, look no further than The Gourmet Chocolate Pizza Company. 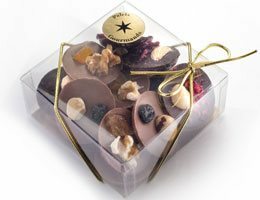 We are delighted to offer you a range of vegetarian and vegan-friendly chocolate gifts. So, whether you’re shopping for treats for yourself or someone else, there’s plenty to choose from. You’ll find our full selection of vegetarian friendly chocolate gifts below. Made from the finest, smoothest, and most delicious Belgian chocolate, we couldn’t blame you if you added perhaps one or two to your basket for yourself! 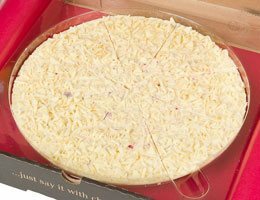 Here at The Gourmet Pizza Company, we are pleased to be able to offer you a range of chocolate pizzas and gifts that are suitable for vegetarians. 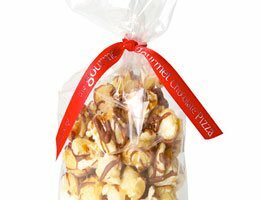 They make the perfect treat for yourself, or a unique and delicious gift for everyone from friends and family to colleagues. It may come as a surprise to discover that not all your favourite sweet treats and chocolate bars are suitable for vegetarians. When you shop with us, you can rest assured that any chocolate gifts you purchase from our vegetarian range are just that; vegetarian-friendly. 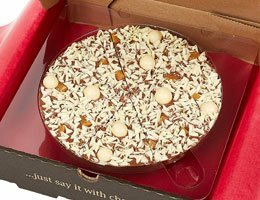 So whether you’re looking for a gourmet chocolate pizza or simply the perfect chocolate gift, you’re in safe hands with us. 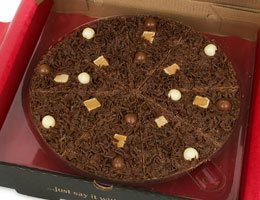 Our vegetarian chocolate pizzas and chocolate gifts are made from our gourmet Belgian chocolate. This means it’s packed with more cocoa, and is smoother than chocolate you might have had before. 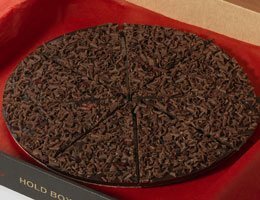 A little goes a long way when it comes to our gourmet chocolate; which is why our chocolate pizzas are delivered pre-cut into perfectly proportioned slices; allowing you to enjoy as much, or as little, as you like. When it comes to flavours; the choice is yours. We have something for every taste and every budget. 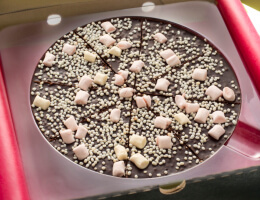 For those with a wicked sweet tooth, our devilishly double dark and delicious chocolate pizza will hit the spot every time. In fact, it’s lactose and gluten-free, as well as vegan and vegetarian-friendly, too! 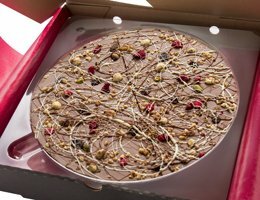 For those who like a bit of fruit in their sweet treats; the fruit frenzy combines zesty freeze-dried raspberries and blueberries with creamy white chocolate curls, whilst the adventurous amongst us will enjoy the spicy kick from the chilli oil infused chilli chocolate pizza. The fun doesn’t stop there, though. 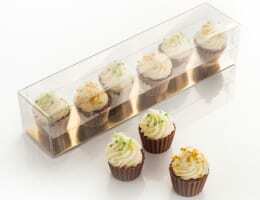 Check back regularly to see our latest creations and seasonal sweet treats just waiting to tempt to you!